Ridding your Home of House Spiders - Yes Pest Pros, Inc. Ridding your Home of House Spiders - Yes Pest Pros, Inc.
Spiders are so universally feared that they have their own phobia: arachnophobia. Despite this fearsome reputation, almost all of the spiders found in the US are totally harmless. 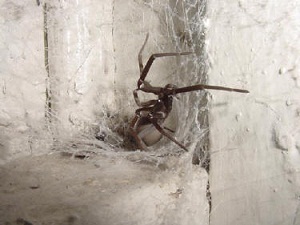 Only the black widow and the brown recluse pose a threat to humans. Still, house spiders often cause homeowners to call a pest exterminator. In the right place, spiders are quite beneficial. They eat more problematic bugs like mosquitoes and flies. They generally keep to themselves and are quite shy of people. If kept out of a human’s domain, most spiders don’t require pest control at all. The spiders that homeowners most often see are common house spiders and these are not a threat. Even if they are harmless, spiders still don’t make very good house guests. Their webs are messy and unattractive. And no one really wants to see spiders, no matter how beneficial they are. A few can deliver an itchy or painful bite. But how do you keep your house clean of house spiders? An exterminator can use environmentally safer as part of an integrated pest management system. Integrated pest management uses multiple techniques customized to your property to reduce and eliminate the pests on your property and prevent the recurrence of infestations. This system will reduce the instances of most pests in your home like spiders but also ants, rodents and roaches. Homeowners can also help keep house spiders under control between exterminator visits. Here are a few tips to keep them under control. Tight fitting screens and doors will make sure spiders don’t have a way into your home. Cracks and crevices should be caulked to prevent access. Sodium vapor lights and yellow light bulbs are less attractive to insects, the spiders prime food source, than the typical white type. Use these in outdoor fixtures so you aren’t attracting bugs for spiders to feast upon. Spiders often set up homes in doorways where lights are located and then sneak inside. Turn these lights off when they aren’t needed. A little house cleaning can help prevent house spiders and save you a call to a South Bend pest control company. Reduce the leaf litter close to your home. Keep the interiors well swept, and vacuumed, especially in corners and dark spots. Spiders will usually move to another spot if their webs are regularly destroyed. These measures should help you keep house spiders outside of your house, where they can go about the business of controlling the insect population as nature intended. Remember, most spiders are nothing to be feared. They play a vital part in our ecosystem and should be respected.